LEEDS, UK (CelebrityAccess MediaWire) — Post-punk pop group Gang Of Four have postponed their upcoming tour of Australia, citing family trouble for one of the group's members. The group had been set for a series of dates where they were to perform their 1979 album Entertainment! in its entirety to mark the album's 35th anniversary. The group had shows set for Melbourne, Sydney, Brisbane, and Perth. 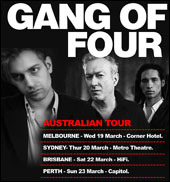 A statement released by the band on their Facebook page read: "Gang Of Four’s forthcoming Australian tour dates have been curtailed by some unforeseen family circumstances of a serious & personal nature."